As we left the chaos of Mumbai, we were hopeful for the weather. During the two days we had spent acclimatising there had been hardly any rainfall; a few light showers, but nothing to warrant worrying about. As we hit the road on Sunday, we were excited. Excited to see the rest of this incredible country and hopeful for the weather. Maybe we had timed our arrival just right? We headed first back down to the southern most point of the city, the end of the peninsular where the Gateway Of India is, where a short ferry would take us to Mandwa or Alibag. After a couple of hours of battling with the crazy traffic, and getting caught up in some huge festival procession for Ganesh, we eventually made it to the most touristy spot in the city. As George went off to collect the ferry tickets I had a crowd of at least 30 people around me within seconds, taking pictures and asking, "selfie please, Sir?" George returned with a problem. There were no ferries running between these ports, as it was still monsoon season. We looked up at the midday sunshine. What monsoon?! There had hardly been a drop of rain in the two days we had been in Mumbai. The idea of catching this ferry was to avoid leaving the city island to the east, to then spend an entire day cycling in a westerly direction back to the coast; therefore possibly not counting towards our world record total. This however looked to be our only option. So with this decided, we headed back north, basically in the direction we had just come. A few miles up the road we met an Indian road cyclist who was headed in our direction. His English was excellent and he kindly agreed to guide us up towards the bridge that would take us to New Bombay, where we could exit the city and follow the coast south. After some risky highway cycling, we made it to the bridge and crossed into New Bombay. A little later in the day, very close to our destination of Panvel where we had booked a hotel a motorcyclist pulled alongside us and asked all the usual questions of "where are you going?" "Where are you from?" etc. And then he asked us to join him for a drink. So we obliged and pulled over, expecting a nice warming cup of masala chai. As we sat down, the gentlemen who had asked us to join him said "right then, whiskey or beer Sirs?" And proceeded to order himself and his friend a bottle of Indian whiskey. We enjoyed a beer and some snacks with him whilst he told us of his friends who had moved to England and even phoned one of them and handed the phone to us for a chat! Afterwards he led us safely to our hotel, which turned out to be only around the corner. Although the first day hadn't gone exactly to plan, we still put it down as a success. The following day the rain came. As it did the following day as well. The showers were sporadic but always enough to soak you through, and the dry spells always seemed just long enough to dry you out. Okay, maybe the monsoon is still here! Trying not to let the rain dampen our spirits we pressed on. Until Monday afternoon, when disaster struck. We had our first puncture. We had cycled over 4,000 miles, on all terrains, all the way across Europe, Turkey and Georgia without a hitch before this day. 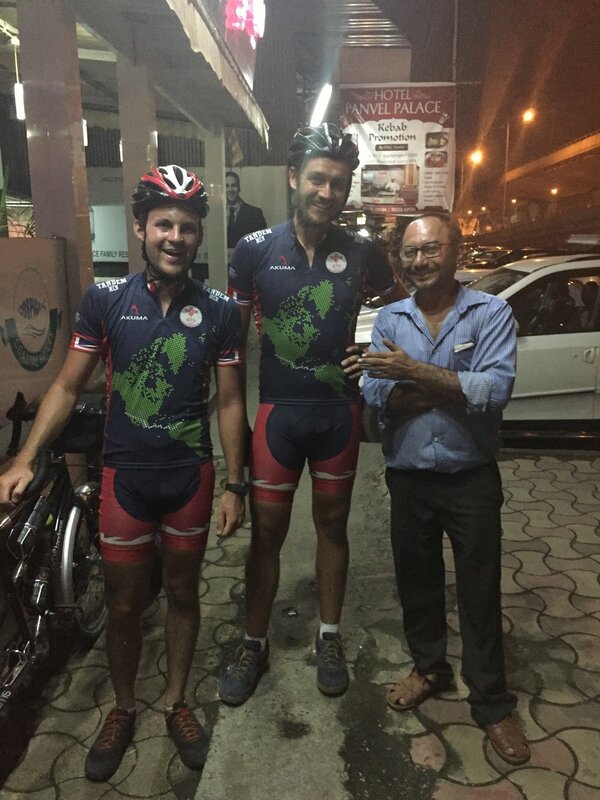 As we started to repair the inner tube, the guy who was running the restaurant we had just had lunch at insisted on helping (he turned out to be a fairly proficient bike mechanic, as I think many Indians are). He refitted the inner tube for us, we put the bike all back together and we were away again. No more than 2 hours later however, the same tyre had gone. Because the inner tube wasn't in straight, it had pinched at another point and had another puncture. We replaced it with a brand new inner tube, and headed to the first hotel we could find to get some sleep. The following two days ran smoothly as could be, another 150 miles under our belt and we were feeling good again. The rain didn't even bother us at this point, we were flying! And then, bang! Just 10 miles short of Malvan, our destination for the end of the day, possibly the loudest bang either of us had ever heard. The rear tyre had gone again. And this time in spectacular fashion, a huge tear in the sidewall of the actual tyre and an inch rip in the inner tube itself. Not knowing how far we were from a town, let alone a bike shop, we rudimentarily fixed the tyre as best we could and put a new inner tube in. After only a few minutes, even in the middle of nowhere a crowd of locals on scooters and tuc-tucs had gathered around us and they informed us there was a bike shop no further than 1km away in the next town. With this, for the good of the new inner tube we decided to push the bike into town and sure enough we found the bike shop straight away. We purchased two new inner tubes and a new tyre for the grand total of 350 rupees (approx. £4). We then looked for a hotel and left the fitting till morning. What a day it had been! At the top of our biggest climb so far in India, 750 metres above sea level. 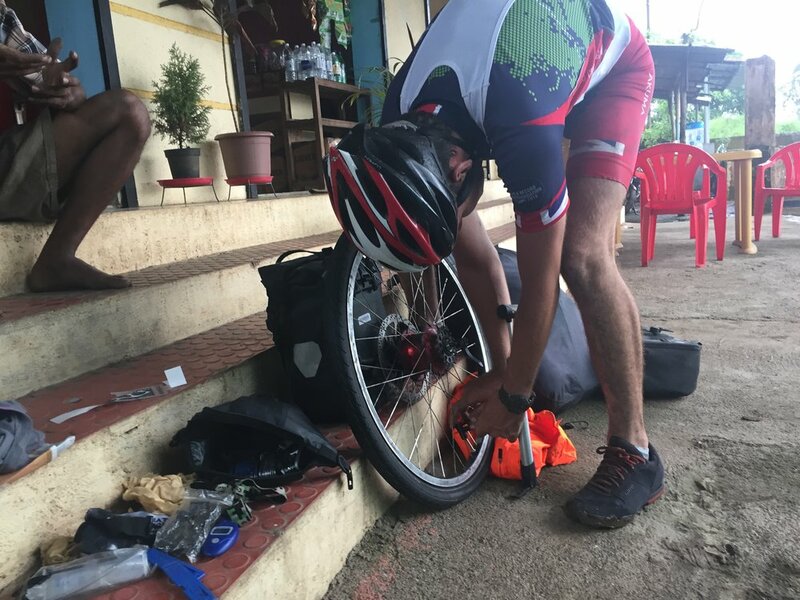 After a poor nights sleep in the damp room we had been given, we fitted the new tyre as best we could, hoped and prayed and crossed our fingers and toes that it would get us to Panjim, Goa where we could pick up some decent tyres and give the bike a bit of a service. Panjim was 75 miles away on the coastal road, and in all honesty, we weren't hopeful for this tyre. We slowly progressed however, 10 miles down, 20 miles, 30... Before we knew it however it was dark, and we were only about 15 miles short. We pressed on into the darkness, through little Goan resort towns and along the seafront (which was luckily mostly street lit and made it to our destination just after 10pm. What a feeling! The little replacement tyre had made it to Panjim! Hurrah! Today we are taking some rest and relaxation and giving the bike a bit of a spruce. Then, we head south on to Kerala and the southern tip of the country.